This Nativity scene from the island of Madagascar contains the Holy Family placed in the trunk of a baobab tree. 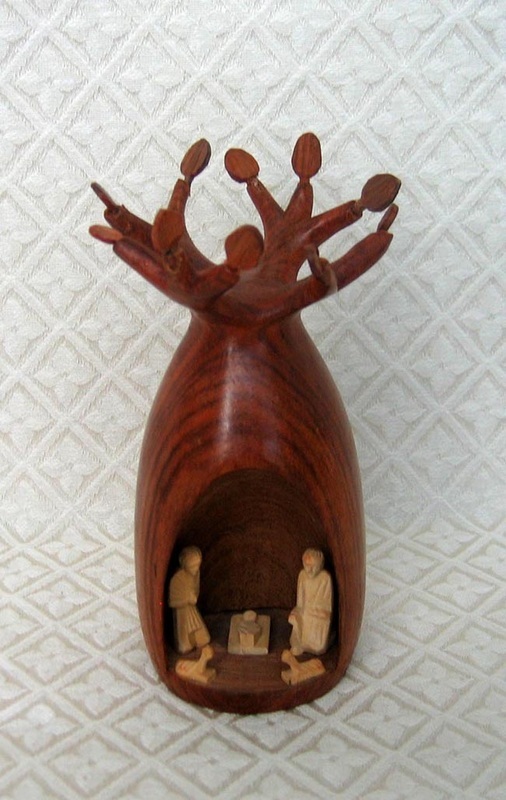 The Holy Family pieces are carved from a precious white wood called Fanazava. The baobab tree is carved from palisander wood, which is from the rosewood family. Palisander is very hard and contains a natural oil as found in rosewood. The piece measures 5.5 inches high. A baobab is a great tree to include with a Nativity scene because this tree has been known to live up to 3000 years (so there are Baobab trees alive today that were alive when Jesus lived). The Baobab tree is also known as the Spirit of Life Tree in Africa.